To learn with respect and belief; to challenge, create and dream! Elm Class is made up of enthusiastic Year 1 pupils. Keep checking back to see important messages and what we have been getting up to! This week we have been planting our own seeds and learning all about plants. We have labelled the different parts of the plant, learnt about what plants need to survive and the stages of growth. The children have loved planting the seeds - watch this space for updates as they grow! How can we sort these animals? Which animals would be the best pets? Which animals are the most dangerous? We have been exploring shape this week and the children were given the challenge of making a rectangle using triangles. The children worked together and persevered to find multiple different ways of making rectangles. The children have really enjoyed exploring capacity and measurement over the past couple of weeks. They used cups to measure the capacity of each container and recorded it in a table. Then, they went on to compare the containers. Over the next couple of weeks, we will be using Titch as our focus text. We will be looking at how we change and grow over time, as well as looking at the growth of plants too! Elm, Chestnut and Ash classes spent Monday morning making sandwiches and cookies for the finale of our Bears topic... 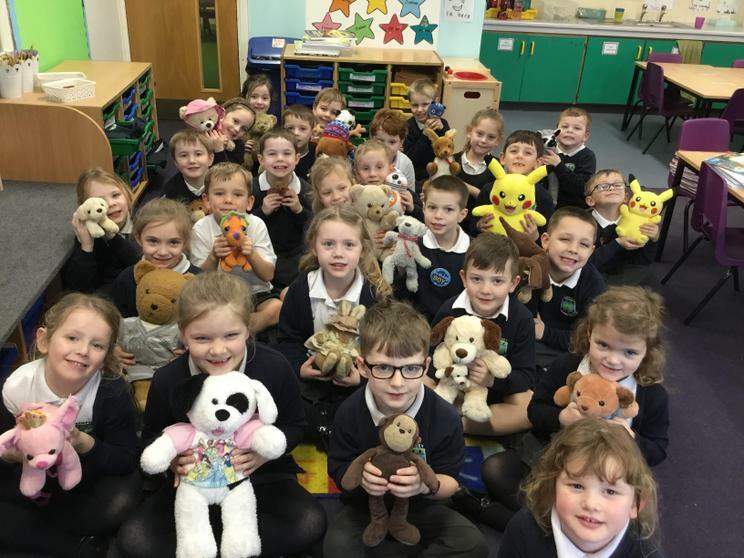 The teddy bears' picnic, which took place in forest school. Thank you to everyone who came and spent the afternoon with us. The children have absolutely loved all of the activities and investigations during British Science Week. We hope to see you at our Science Fair on Friday so we can demonstrate some of the experiments! Year 1 and 2 mixed up into three groups for the morning to complete two very exciting experiments! They created lots of fantastic opportunities for discussion, especially about fair testing, predictions and justification of opinions. The children were given a piece of string to move an ice cube from one bowl to another. They worked together to try different approaches, including tying knots around the ice cube and lifting the ice cube up by balancing it. We then gave the children some salt. They soon realised that this really helps the string to grip onto the ice and they could move it much more successfully! For this experiment, the children were given two paper cups, some kitchen roll and some food colouring. One cup was filled with water, which they add food colouring to. The children were asked to help the water travel from one cup to the other without pouring! They used two types of kitchen roll and explored which one was the most absorbent and therefore the best one to use to soak up the water to help it move from one cup to the other. The food colouring was used to help the children to see the water soaking up into the kitchen roll more easily. In forest school, we made journey bracelets to show how we had moved around forest school. The children stuck different things to their bracelet including seeds, leaves and even pieces of litter! This told a story about where each child had been and what they had found. There were some great discussions around the different types of leaves and seeds in forest school, as well as whether we thought the pieces of litter belong in forest school and what we can do to stop litter. The children made a fantastic effort with their costumes! They enjoyed sharing stories and exploring their favourite books and authors. Thank you to our lovely parent readers who came in to read stories with the children. The children were so excited about pancake day so we decided to involve this in our learning about weights and measures in maths this week! They used a range of different weighing scales to measure out the ingredients we needed for the pancakes. After the children made their pancakes, and tasted them of course, they wrote very detailed instructions. We were super impressed with the quality of their work, especially their presentation! To answer their question, we showed them this amazing video from Planet Earth II! In forest school this week, we decided to build a den for a bear! We used natural resources such as sticks and leaves to create a warm, dry shelter. 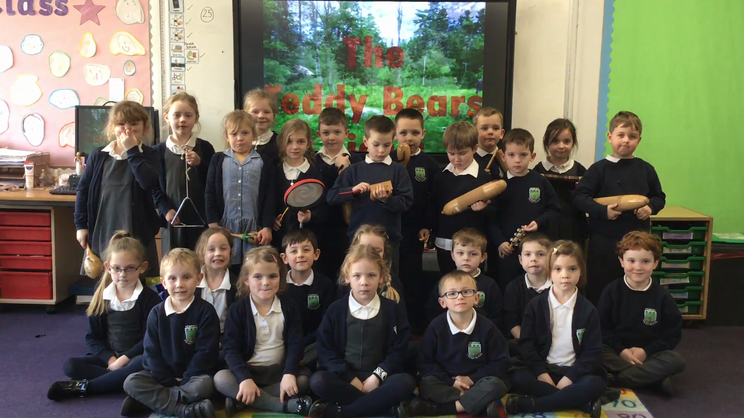 This week we looked at the song Teddy Bears' Picnic and added our own sounds using a range of instruments. The children really enjoyed singing and playing the instruments to the beat of the music. We cannot get this song out of our heads now! The children enjoyed looking for bears in forest school! 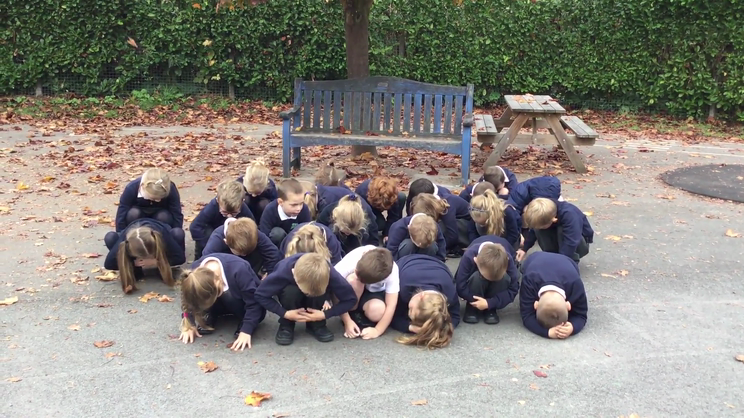 They acted out the story of We're Going On A Bear Hunt by Michael Rosen and found lots of way to go over and under things! As you might be able to guess, our new topic in Elm Class is all about bears! We kicked things off with the children bringing in their favourite teddy bear. We enjoyed a circle time session discussing why our teddies are special to us. On our first day back, we were lucky enough to have a visit from Harnaam Kaur, a bearded lady, who talked to us about body positivity and kindness. 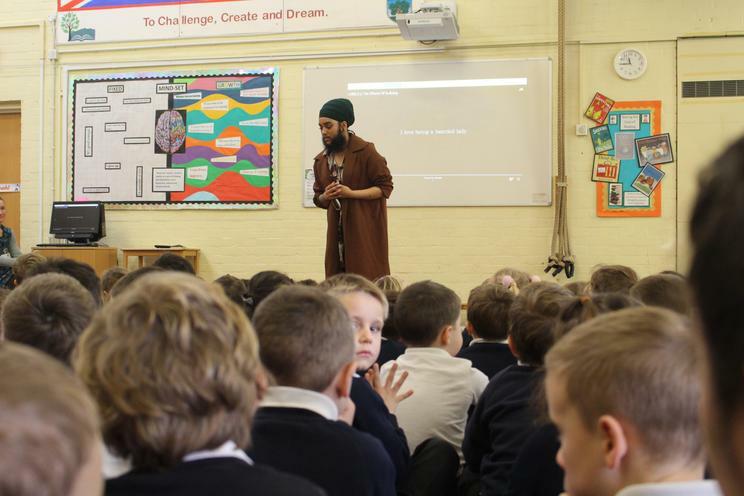 The children found Harnaam's story extremely inspiring and came up with some fantastic, mature comments after the session. Sharing Topic Homework with Our Class Governor! 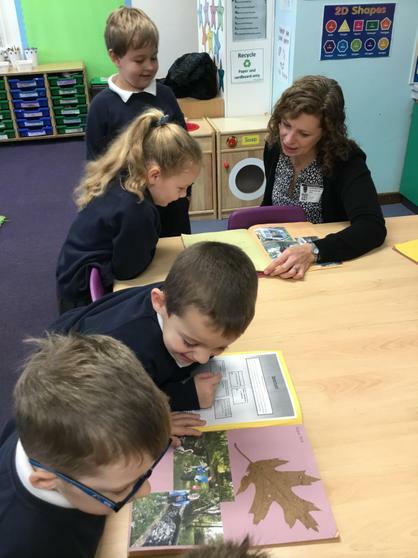 The children were so excited to show our Class Governor, Cathy Garner, their topic homework projects all about autumn! They had been working on this for a few weeks and were very proud of what they had achieved. This week we have had a World War 1 focus to celebrate Armistice Day. The children designed and created their own medals, made poppies and found out about the special jobs that different animals had during WW1. In maths, we have been looking at grouping objects to prepare us for moving on to multiplication. The children sorted concrete objects into groups, including 2s, 5s and 10s. This week we have been practising a poem by Julia Donaldson called The Nut Tree. The children worked really hard to memorise the poem. They projected their voices and practised some actions to go with the poem! We really enjoyed our trip to the University of Worcester on Wednesday for the Beeline Storytelling Festival. Our first session was with an author in the storytelling yurt and the children enjoyed the story of 'The Magic Pot'. Then we had a look around the Royal Infirmary Medical Museum, where the children enjoyed dressing up in old and new medical clothing! Finally, we watched a puppet show of 'The Three Billy Goats Gruff'. The children loved the story and laughed throughout almost the entire puppet show! Elm Class have been enjoying taking part in an active 10 minutes every morning! This helps us to get our bodies and minds ready for the day ahead! So far we have been practising balancing and throwing bean bags, as well as using hoola hoops. Come back soon to find out what other skills we have been practising!